Table runners are so popular, they make great gifts and usually fast to make. Here's one with a twist, so very different and unique. This wonderful project will spice up the conversation at any table setting. The table runner is made by using a 9 degree Circle Wedge Ruler. Finished size is 42in by 25in. 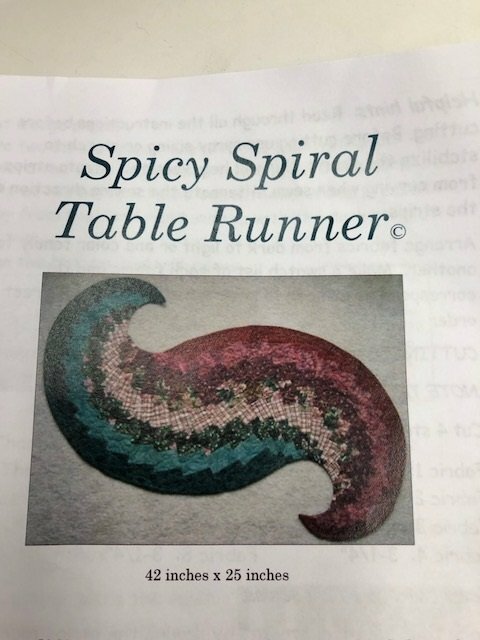 Purchase the Spicy Spiral Table Runner Pattern by School House Quilts. Pleasehave your fabrics picked out prior to class. Bear’s Paw Fabrics will be happy to help you in this process. You will receive a 15% discount on fabrics and supplies purchased at Bear’s Paw Fabrics. Read pattern and make stratas (4) all the same. Note Strip Sizes and number 1-8.